It spawned a number of official sequels, and a few imitators, but none of them had the impact of the original. And you can understand why: if you want to play X-Com, you can play X-Com. It’s a game that comes so close to perfection that it’s hard to argue that you even need a sequel. Combat is implemented as a curious mixture of X-Com and Baldur’s Gate. On the one hand, you need to direct your squad members explicitly. By default, the game will pause when a squad member has no orders. On the other hand, you can also pause the game at any time and issue new orders for a squad member, adding to or superseding previous orders. Unlike X-Com, all movement and combat is resolved at the same time: you give orders to as many of your men as you like, unpause, and they go forth to conquer or perish. Among the more successful aspects of UFO: Aftershock is the individuation of squad members. 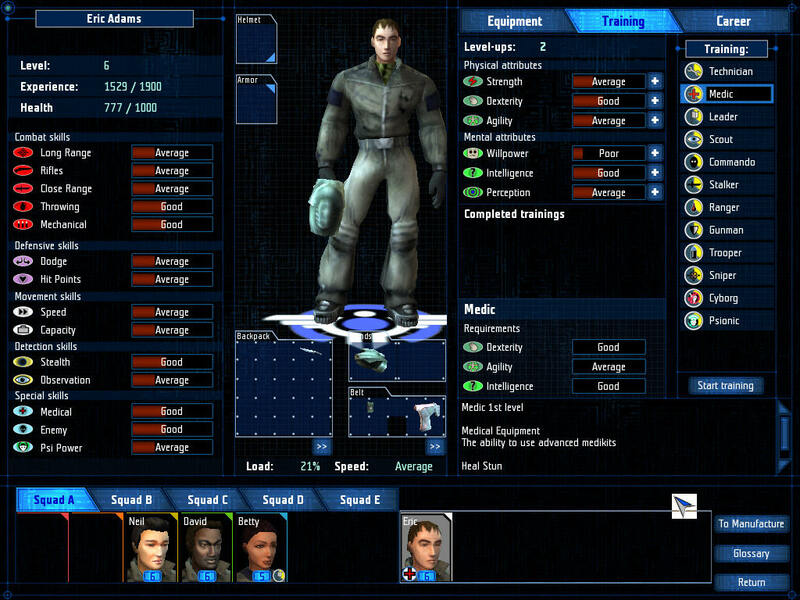 In this style of game, life for squad members is typically nasty, brutish, and short. I might feel some small affection for Kenji Masumoto in X-Com, but realistically I know that every time I send Kenji out on a mission, there’s a damn good chance that he’s going to get cut down in a hail of gunfire the moment he disembarks his aircraft. This means that I try not to get too attached to characters in these games. In UFO: Aftershock, your squad members are a bit more resilient. They can take more damage, they can heal each other more effectively, and they are modeled with more personality. In X-Com or Jagged Alliance, it’s perfectly common for one lucky shot to blow away a squad member. In UFO: Aftershock, it’s more typical that either everyone in the squad survives, or everyone dies. Furthermore, as the game progresses they level up, and you decide their career path and specialization. This starts happening almost immediately, at a much faster pace than in similar games, such as Jagged Alliance. So it’s easier to create a vision in your mind of who the character is, and why you don’t want him or her to get killed. Tactical battles take place in a strategic context. 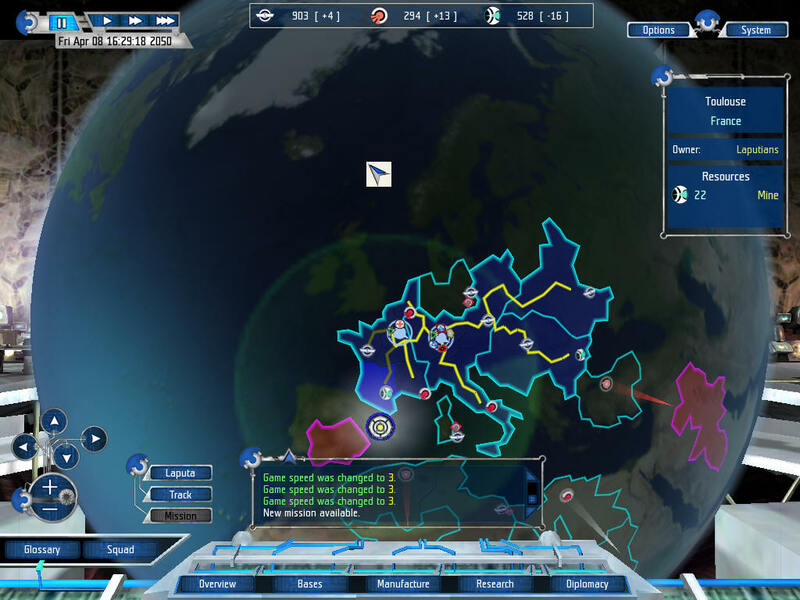 The game uses the “geosphere” graphic introduced in X-Com, but makes the strategic game more sophisticated. The player is confronted with a Risk-like map of territories. Each territory either houses a base (which can be developed to perform research and/or produce items), or provides one of three types of natural resources. Players conquer territories to gain access to these resources, but the act of conquering them also increases the upkeep required to feed your empire. Your base, a movable floating island called a Laputa, can project power over an area about as large as western Europe. Moving the base around takes substantial time, adding another strategic element to the game. The strategic game shows promise, and is certainly more involved than that in similar games, but feels somehow tacked on. It’s troublesome, because the strategic and tactical games are so different, the overall effect is that each feels like it is interrupting the other. X-Com had this problem too, but combat (at least in the early part of the game) happened much less frequently. This gave you some time to adapt to the strategic game and get some production underway. UFO: Aftershock, on the contrary, rarely allows a single day to pass before forcing you to send your exhausted marines out on another assault. The end result of this is that the strategic game was complex enough to intrigue me, but the game never allowed me to play it enough to feel confident that I was learning its subtleties. The tactical game is where you will spend most of your time in-game. Viewed purely in terms of game mechanics, it works well. You can apply standard squad assault tactics (two teams leapfrogging, one covering as the other advances, concentrated fire, and so on), and they work just like you’d want them to. There are a good variety of weapons and different skills. Your squad members’ different skills are clearly reflected in combat. Unfortunately, some of the rigging in the tactical game detracts from it. The fact that there are no pre- set turns mean that the game pauses and unpauses wth a frequency that rapidly becomes distracting. The design decision to only have essentially one type of terrain (industrial sites) gives the game an oppressive mood. And anytime you have to go inside a building, or navigate your team under an overpass, you will curse the terrible camera management. But, of course, a gritty, oppressive mood does not by definition make a squad combat game bad. Many designers strive mightily to impart just such a feel to their games. The problem here is that I – and, let’s face it, everyone else – are comparing the game to its spiritual predecessor, which had a cartoonish, anime style, and a sensibility that came out of the British UFO TV series. Viewed as an attempt to recapture this feel, the game falls short. But viewed as a birds-eye alternative to games such as Rainbow Six, it works quite well. It’s all a matter of perspective.